Timetable of the buses coming to and from Bansko. The information is regularly updated. Timetable of the trains from Railway Station Bansko you can find on the given link. The distance from Sofia to Bansko is approximately 160 km, the duration is 2.5 hours. The average price of the ticket is 13 leva. 7:30, 8.30, 9:45, 13:15 /except Sundays/, 14:00. 7:00, 9:20 /except Tuesday/, 10:30, 11:50 /except Sunday/, 13:05, 13:55, 14:30, 14:40, 15:10, 15:28 /except Tuesday/, 15:55, 16:30, 17:00, 17:30. Attention: Some of the buses are only passing through Bansko. The most of them have Gotse Delchev, Ognyanovo, Yakoruda, Bania or Eleshnitsa as final destination. The distance Sofia - Bansko is approximately 160 km, the duration is 2.5 hours. The average price of the ticket is 13 leva. The distance Blagoevgrad - Bansko is about 60 kilometers, the duration is 1 hour. The average price of the ticket is 6 leva. The distance Blagoevgrad - Bansko is about 60 kilometers, 1 hour duration. The average price of the ticket is 6lv. 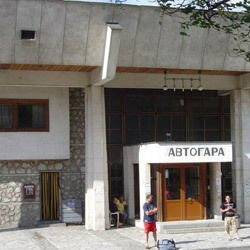 Buses going from Bus Station Bansko to Blagoevgrad - 5:03, 5:10 / except Sunday /, 6:00, 6:30, 6:55 / except Sunday, 7:20, 8:00 / except Saturday and Sunday/ , 8:10, 10:00, 10:30, 11:20, 11:30, 12:35, 13:15, 13:20, 14:00, 14:55, 15:15, 15:51, 16 : 20, 16:22, 17:00 / on Friday, Saturday and Sunday/, 17:25, 17:30, 17:50, 19:30. Some of the buses are only passing through Bansko. Dobrinishte - 17:50 and all passing buses of Gotze Delchev. Mesta - 17:50 and all passing buses of Gotze Delchev. If you are coming from Varna, Burgas, Stara Zagora, Pleven, Ruse and other distant cities, we would suggest you first to go to Sofia and then to take a bus from Bus Station Ovcha Kupel or Central Bus Station to Bansko.